It is now officially hurricane season in the Atlantic (June -November). The Northwest Pacific season started in April and will run through January. The Northeast Pacific runs May through November. The South Indian and Australia Southwest Pacific run November through April; leaving the North Indian to April through December. It looks like the only months outside hurricane season anywhere on the planet are February and March. While earthquakes are season-less, there are still enough other weather-related opportunities for disaster. Tornados and flooding are certainly wrecking their havoc. But when I heard the list of first five names for the 2011 Atlantic season, Arlene, Bret, Cindy, Don, and Emily, I noticed two were males names! Hmm. Not only are men’s names better represented, names common in other countries bordering their respective oceans are now included. Wow. Even the World Meteorological Organization exercises equal opportunity. The legal community has also been keeping up with tropical storms. Act of God is a legal term for events outside human control, such as tropical storms, flooding, and other natural disasters, and for which no one can be held liable. Interestingly, human causes are now trying to be linked to what was once considered and act of God: he 2006 earthquake in China is being attributed to the building pressure in dams led to the releasing of a geological fault, for example. Wanting to hold someone liable, and thus financially responsible, may turn out to be a great deal for God. So what does Atlantic hurricane season have to do with anything in the eternal scheme of things? We’ve been personalizing tropical storms by naming them since 1945. The rules and names have changed over the years, but there is still a pre-determined list of names that are attached to tropical storms when they meet certain criteria. There have been several named Linda, but none of been particularly horrific since the name is still used. Particularly destructive storms names are retired. Even personalizing storms doesn’t change being able control them. We have more information about them, more warning about their force, even more ability to prepare ourselves. But when given the opportunity to prepare ourselves, we still don’t prepare. What does that say about us? And we still get to blame God! Several names from my family are slated for use in 2015. My oldest son, husband, and father’s names come up for availability in the Atlantic. My name becomes available for the Northeast Pacific. Hmm. Might be an interesting year. 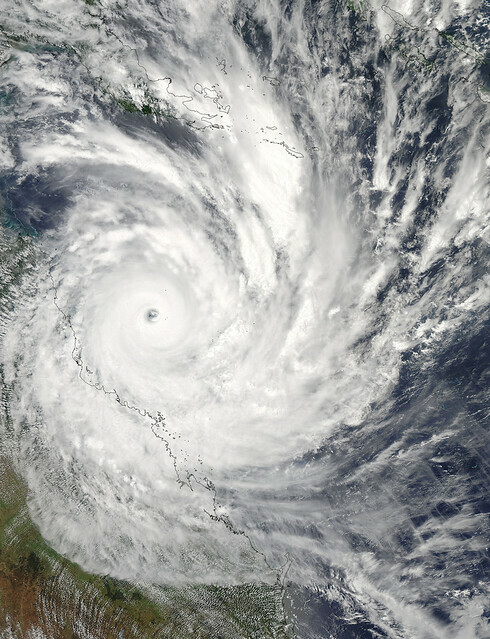 Photo: NASA’s Aqua satellite captured this visible image of Cyclone Yasi making landfall in Queensland, Australia. The eye of the cyclone is very clear and indicative of the power of this tropical cyclone. Hurricane Janet made her first appearance in 1955. Very destructive 🙂 Janet is now a retired name.